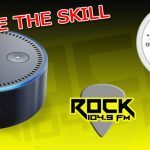 Rock 104.9 is now available on Amazon devices with Alexa. Now, Rock 104.9 is available anytime on your Echo, Echo Dot, Echo Show, or any other Alexa-enabled device. OR set up Rock 104.9 on your smartphone with the Alexa App. Search for Rock 104.9. Tap on the station logo to get to the Rock 104.9 skill. Tap “Enable” to enable the Rock 104.9 skill.